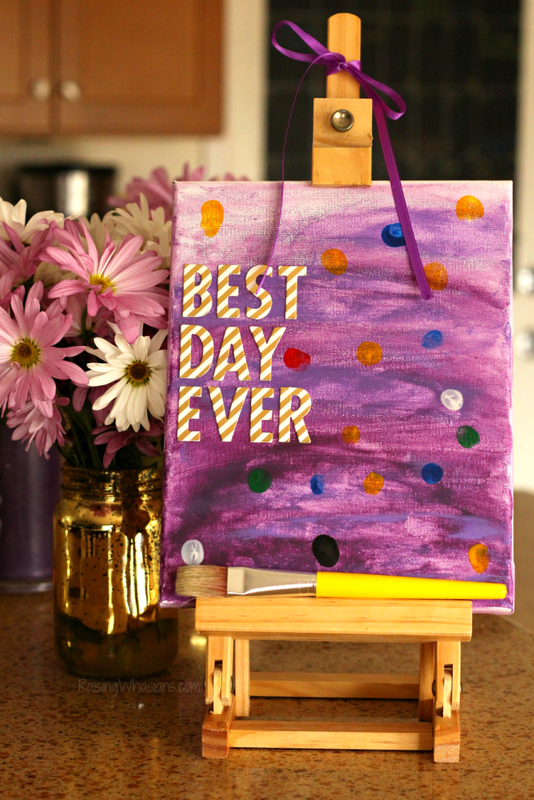 Ready for the Best Day Ever? 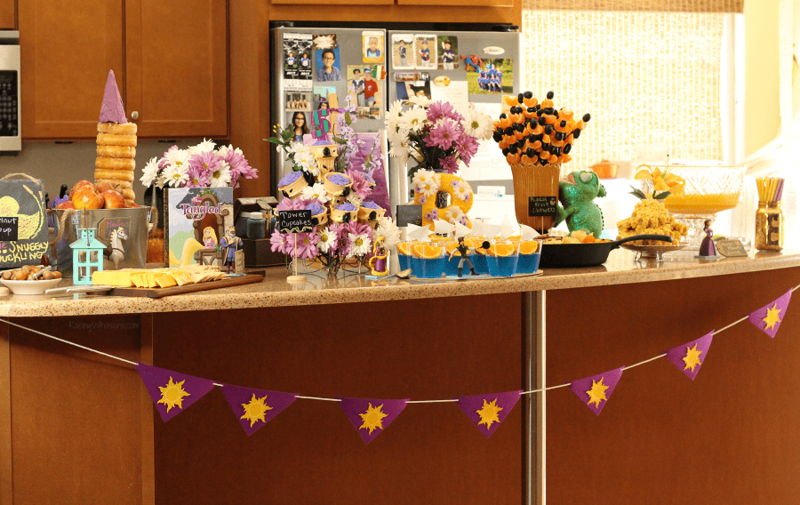 Grab these Tangled Party Ideas for My Rapunzel’s 5th Birthday; DIY, food, decor, free printables & lots of Disney party inspiration, all on a budget under $150! May contain commissioned links. The challenge: a Tangled Party for my Disney Princess for under $150. Tangled is one of my favorite Disney movies of all time. 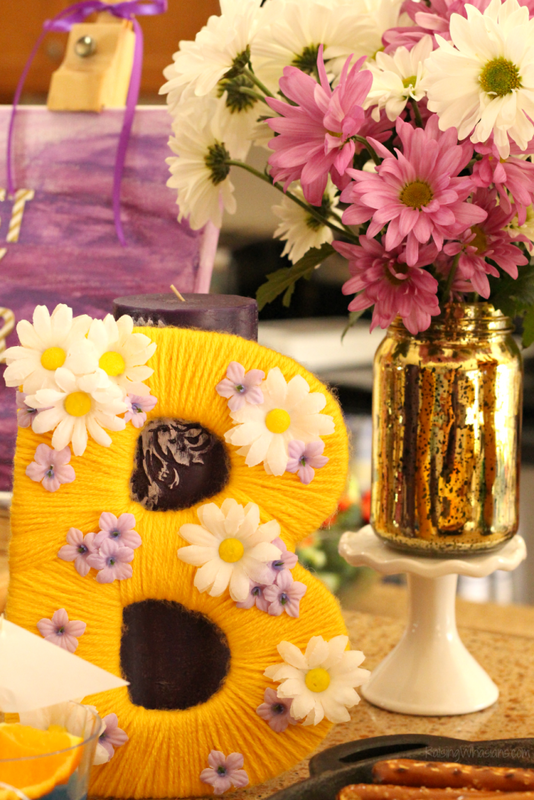 The music, the punchlines, the happily ever after – the perfect theme for my Rapunzel’s 5th Birthday party. But here’s the thing, January birthdays are ROUGH. Right after the holidays, I had to immediately get into birthday party mode. 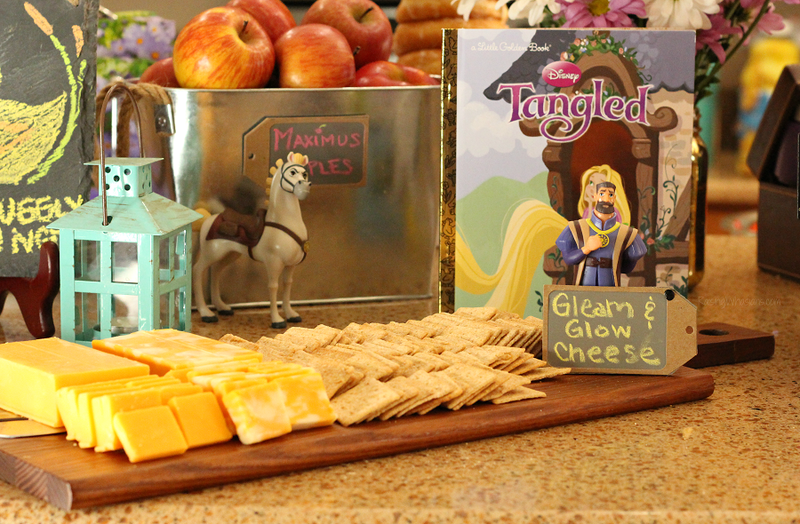 I only had a few weeks to pull together the ultimate Tangled party ideas into a fun party. With her bedroom already mid-Rapunzel transformation, I knew that a Tangled party would not only highlight her love for Disney princesses, but also motivate me to get some bedroom decor ideas done. 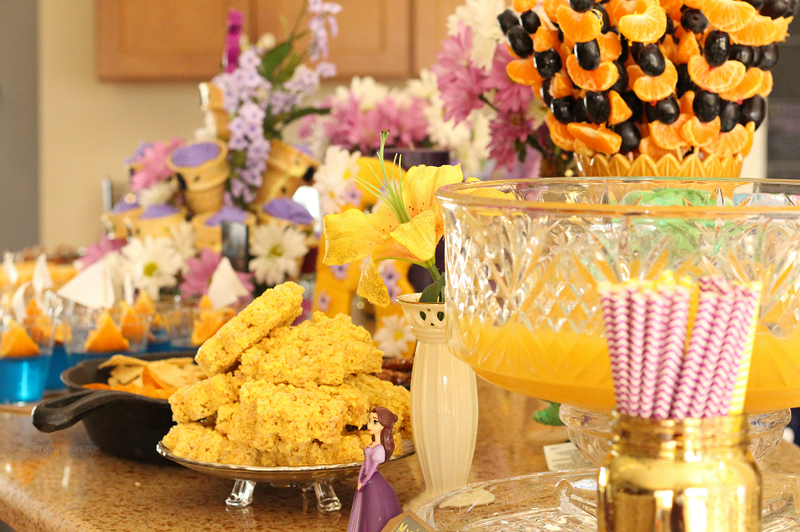 So here’s how we made my favorite party to date with TONS of amazing Tangled Party Ideas including food, decor, and more. Scroll down to up close tutorials, party pictures and even video of my girl’s big day. Combining crafty goodness, delicious food and lots of whimsical Disney inspiration, I think this has to be one of my favorite parties to date. Scroll down and check out all of the food, decor and party inspiration on a budget – under $150 for everything! I LOVE making my own birthday banners. And for a Tangled party, we definitely needed Tangled banner. 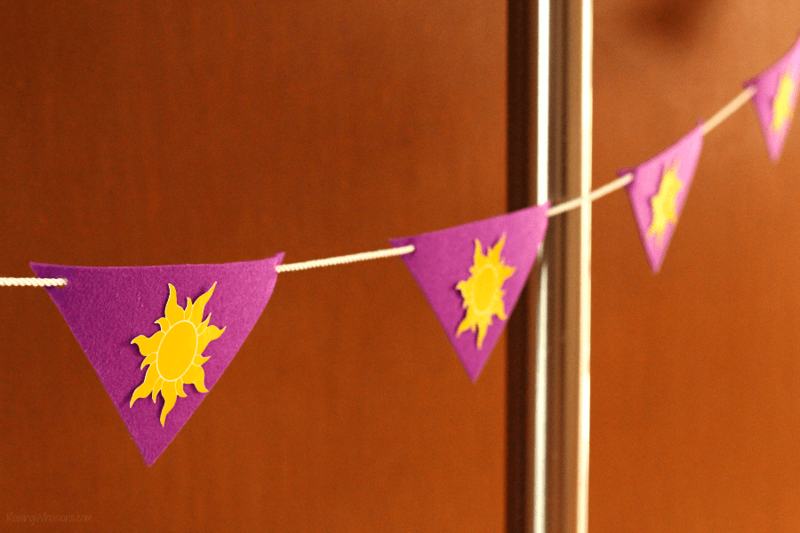 Using craft supplies I already had on hand, I used some stiff purple felt, white nautical rope, single hole punch, hot glue, and this FREE Tangled Sun printable. Cutting the felt into equal triangles, gluing the suns and threading the rope through punched holes, I love how this themed Tangled banner came out. Bonus, this banner now sits as the valence over my daughter’s bedroom window. TIP: Oh, how I wish I had a Cricut machine. See those adorable Tangled suns? I hand cut all of them! Hours of work condensed into a few minutes – don’t be me. Get a Cricut to cut those Tangled suns out for you. 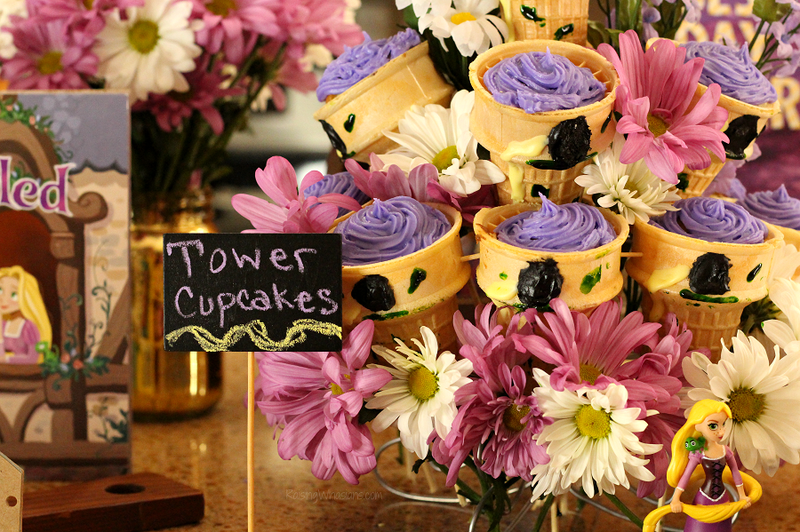 This was easily the sweetest Tangled party idea. 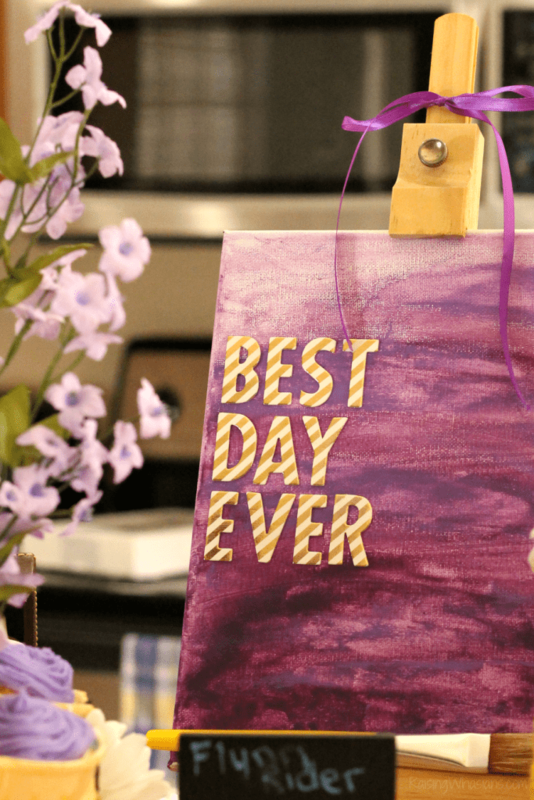 A guestbook, adorable decor idea and interactive art all in one, we definitely can “see the light.” Placing a small canvas on a small tabletop easel, I hand painted a purple background on the canvas and placed gold ABC stickers to create the popular Tangled phrase, “Best Day Ever.” Leaving out fingerpaint for the party guests, everyone placed a lantern fingerprint onto the canvas. When dry, the whole easel and lantern keepsake artwork now sits on the dresser of my daughter’s room. A sweet reminder of her 5th birthday party, she now has a forever piece of art of her special day with prints of everyone that came. Tangled Tower Cupcakes – baked right into cake cones and decorated with a little icing, I love how these cupcakes turned out. Putting them in the cupcake tower however, that was a project! Thankful for family, toothpicks and lots of bamboo skewers to get these cupcakes to stand up beautifully! 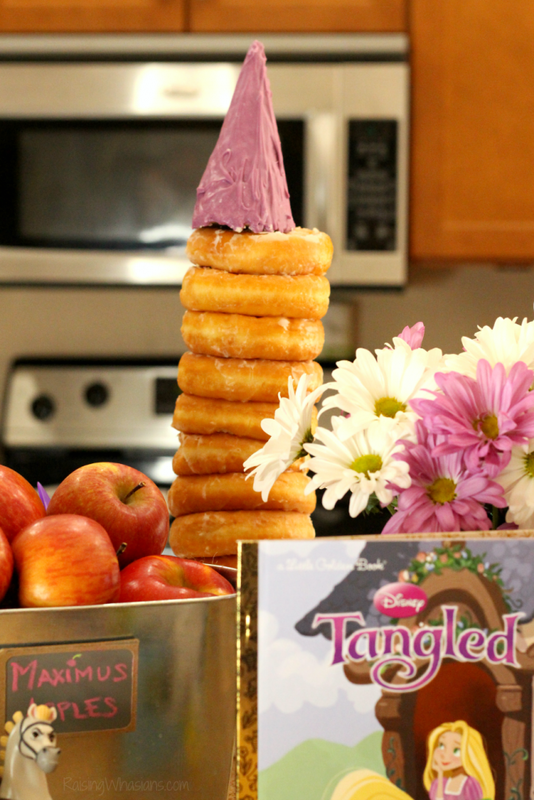 Tangled Doughnut Tower – Did I mention bamboo skewers? Glazed doughnuts, an ice cream cone dipped in purple candy melts and lots of bamboo skewers (and no one was allowed to breathe on them), this doughnuts tower added some height to our day. Plus, who doesn’t love doughnuts? 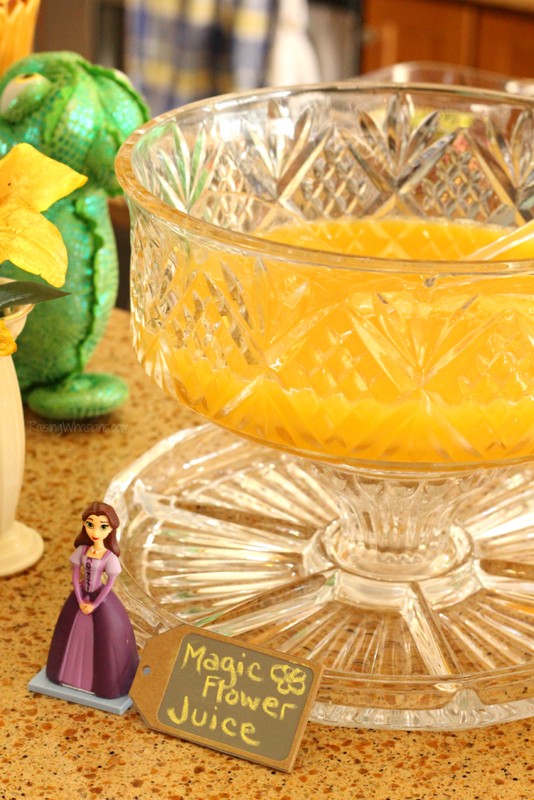 Magic Golden Flower Juice – 1 can of frozen lemonade concentrate, 1 can of frozen orange juice concentrate, 5 cups of water and 3 cups of pineapple juice made this party punch a huge hit! 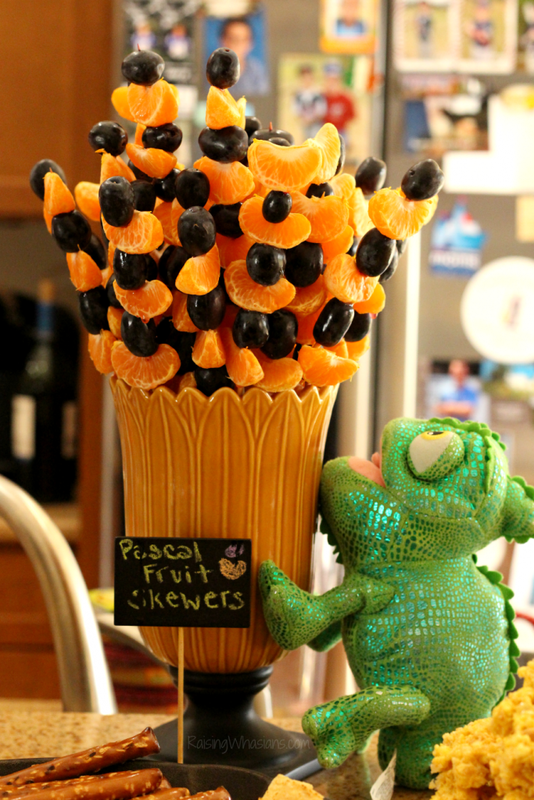 Pascal Fruit Skewers – Reason #1,473 of why I watched Tangled again – so I could see what fruit Pascal was eating to change color at the end of the movie. So tangerine slices and purple grapes it was for these fun Pascal fruit skewers (and more stock in bamboo skewers). 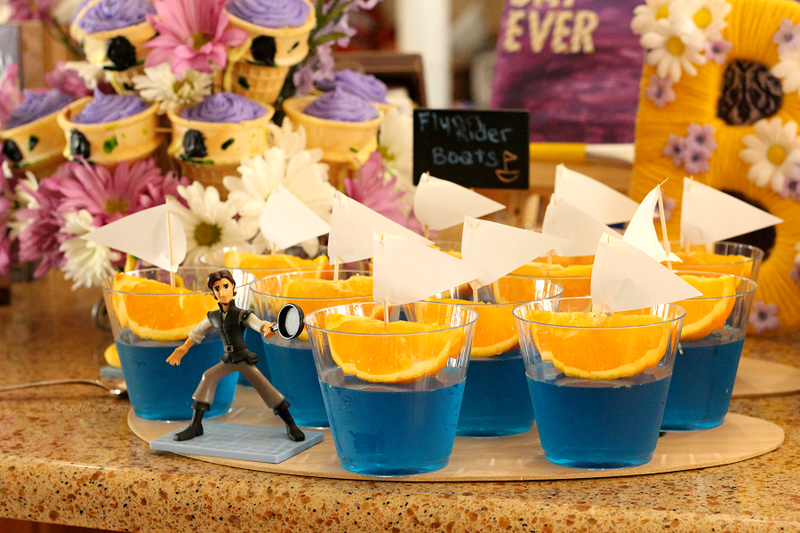 Flynn Rider Boats – Orange slices for boats, blue jello and a few toothpicks and white computer paper made the ultimate adorable Tangled jello snack. Gleam and Glow Cheese Plate – Needed a little bit more gold in our food. So we went with cheddar and colby jack cheese…please! 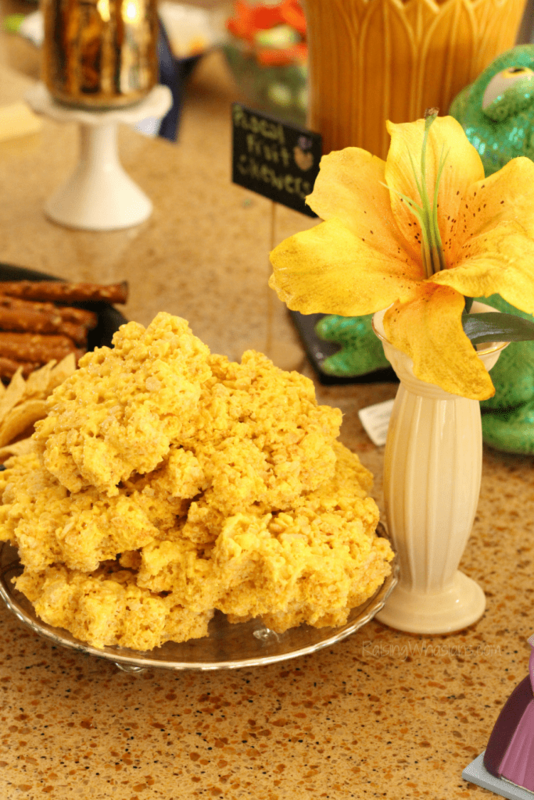 Golden Sun Crisped Rice Treats – Adding a little bit of golden yellow food coloring to the normal crisped rice treats plus a fun sun cookie cutter made this sweet addition a big hit with our party guests. 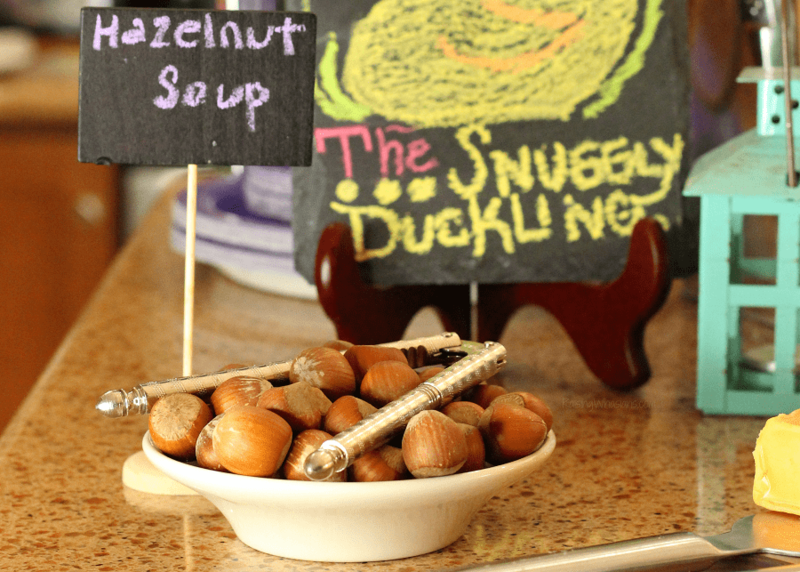 Hazelnut Soup – I had no idea what hazelnuts looked like, but I knew that I needed Rapunzel’s favorite food at our Tangled party! Don’t forget the nut cracker! Frying Pan Snacks – Salty to balance the sweet. 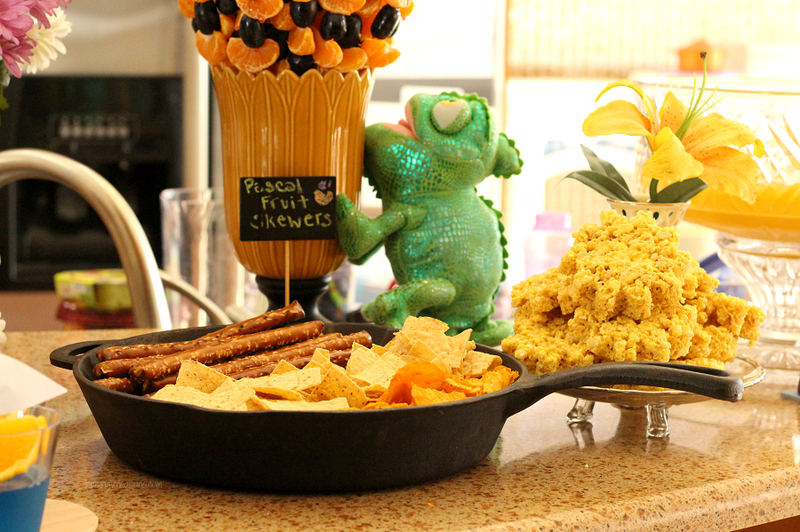 Pretzels and chips filled our frying pan for a fun take on Flynn and rapunzel’s weapon of choice! 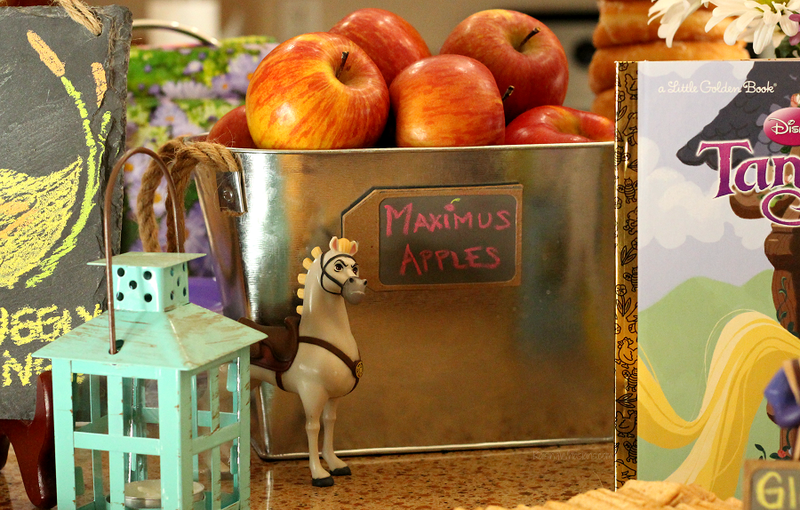 Maximus Apples – Let’s not forget our favorite horse! We had a few choice apples on hand for Maximus fans. Though we may have eaten all of the apples in the kingdom of Corona. I definitely put the most blood, sweat and tears into this decor. Doubling as bedroom decor post-party, I wanted to make sure that I had a beautiful centerpiece that could go over her bed when we were done. I had an old cardboard “B” (for her name) that I got for a steal on clearance years back – but no inspiration…until now. Grabbing a few el cheapo supplies, I made an adorable Tangled Monogram Decor. 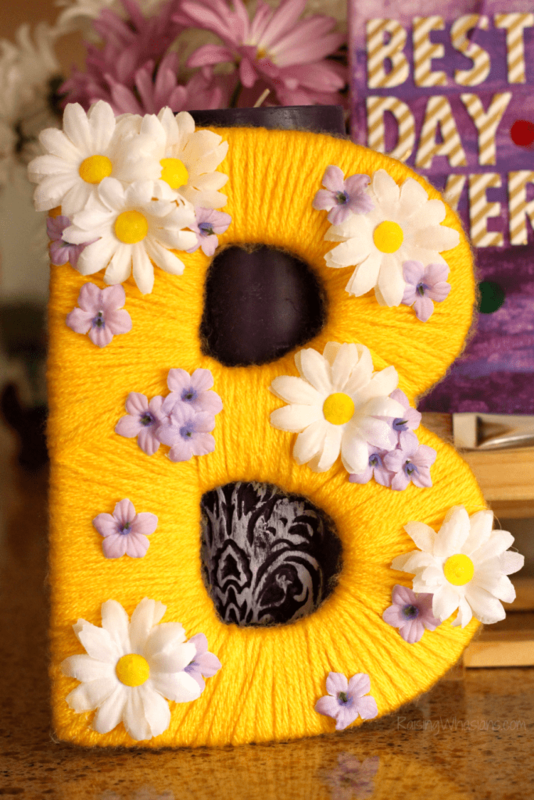 First, I painted the letter yellow/gold, just in case any yarn was to go awry. Then I wrapped the letter in yellow yarn. You’ll need lots of patience and hot glue to hold everything together. Last grab some fake flowers from a craft store (seriously bought mine for $3 in total) and glue in place. How cute, right? Little known fact about me, I love rubber duckies. 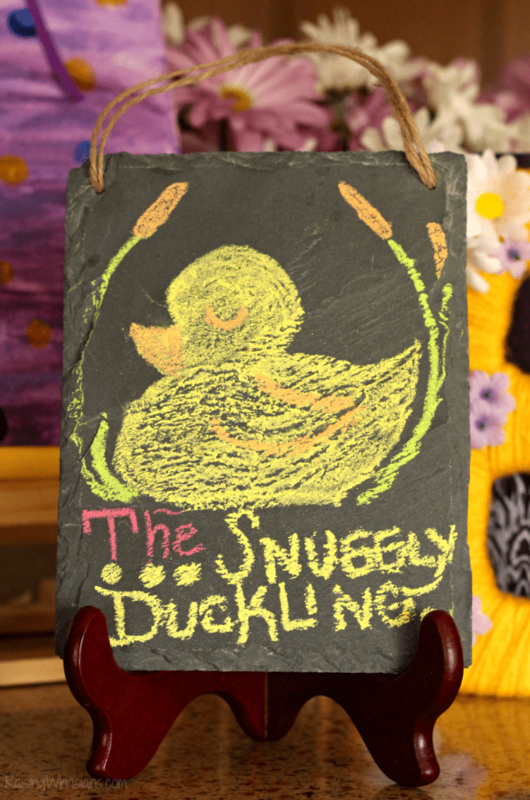 I couldn’t resist paying a little homage to my love of ducks with this DIY Snuggly Duckling Sign. While I certainly couldn’t shell out the money for a handcrafted wooden sign, I did have an old slate sign on hand from a previous craft project. Using a little creativity (and a ton of chalk), I was able to recreate a piece of The Snuggly Duckling on our Tangled party table. Thankfully my family could guess what it was right away (I was worried that my duck looked more like a deformed amoeba). Tangled Little Golden Book – we have forgone traditional birthday cards for books instead. I love these little Golden Books – bedtime story that also doubles as adorable party decor! 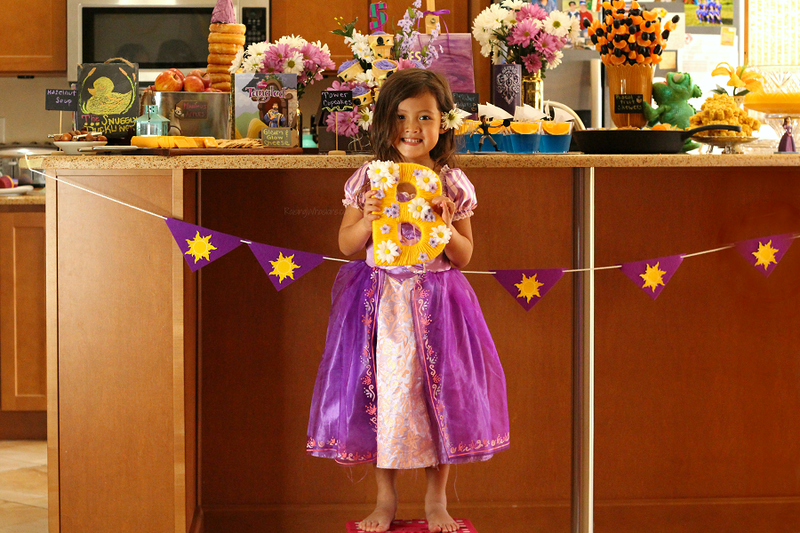 Tangled Party Dress – because every Rapunzel needs the perfect birthday party outfit. Tangled Movie – sets the ambiance, don’t you think? Paper Lanterns – We can’t “see the light” without them. I thankfully had a bunch of lanterns I held onto from my Mulan party. I printed out some black Tangled suns, cut and taped them to the lanterns, strung from fishing wire in the room. Consider purple or parchment color lanterns (like the movie) to add some better theme-ing. Pascal Stuffed Animal – She picked out this lovie on her 2nd birthday. I’m so glad I held onto him. Yellow Crepe Paper Streamers – And let’s not forget Rapunzel’s hair, lots of hair. I went with the most frugal option, some yellow crepe paper. Strung around the room, it was a whimsical touch on a budget! Purple and Gold Party Straws – decor and functional party supply, just place inside a gold mason jar. 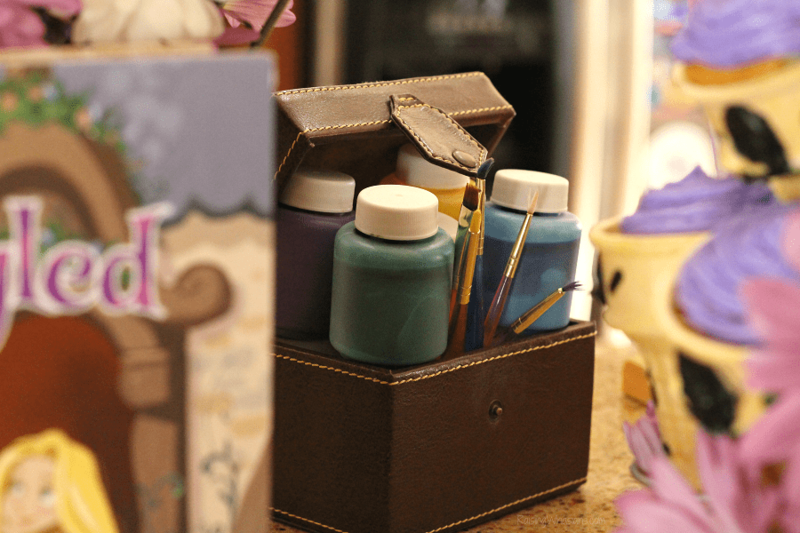 Set of kid paints and paintbrushes – Just like Rapunzel has! 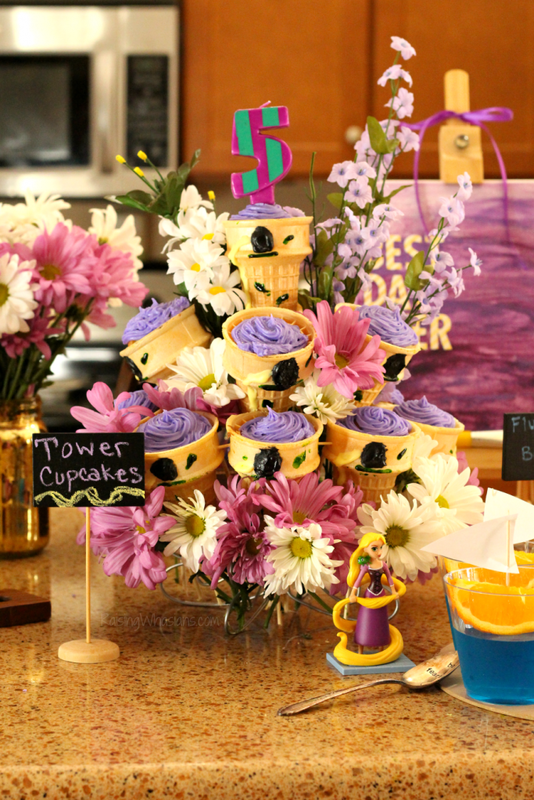 Fresh White and Purple Daisies – spread around the cupcakes and in bouquets, the colors added beautiful fresh pop to these Tangled party ideas. Household Items – From vases to dishes, crystal punch bowl to cheese boards, see if you can utilize items around your home to upgrade your party or ask a friend/neighbor. Bonus – FREE. Pictures are one thing, but seeing the whole party brought to life, that’s something I can grasp. So I made a quick little Tangled Party Ideas video tour of our day, so you can see just how much FUN went into the party planning. The best part? Seeing the results of the party light up this little girl’s face. It was everything my little Disney princess dreamed of. From food to decor, DIYs and everything in between, this Tangled party is one of my most favorite ones to date. I just adore the theme, the movie and this little Rapunzel. It’s a 5th birthday party to remember forever, just ask her. 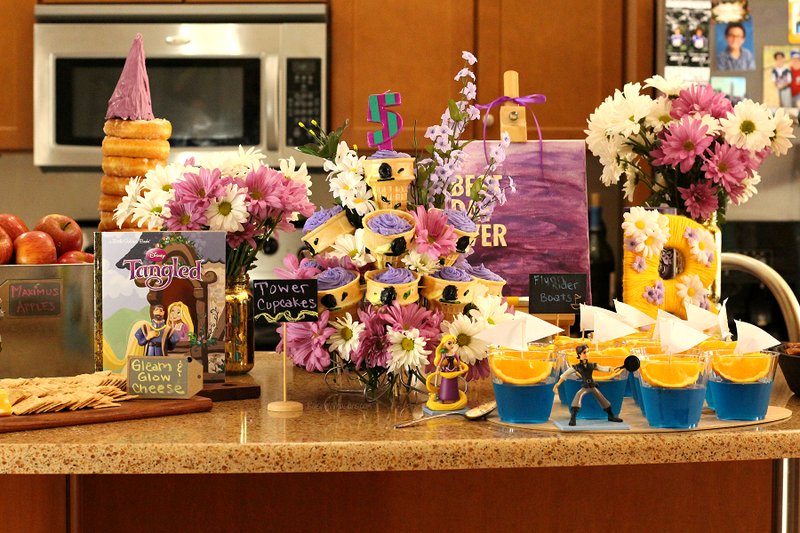 What are your favorite Tangled Party Ideas? Be sure to follow Raising Whasians via Facebook, Twitter, Google, Instagram, Pinterest and YouTube for fun DIY party ideas, free printables, Disney movie updates and more. You did such a good job it’s all so beautiful!!! What a fun party. 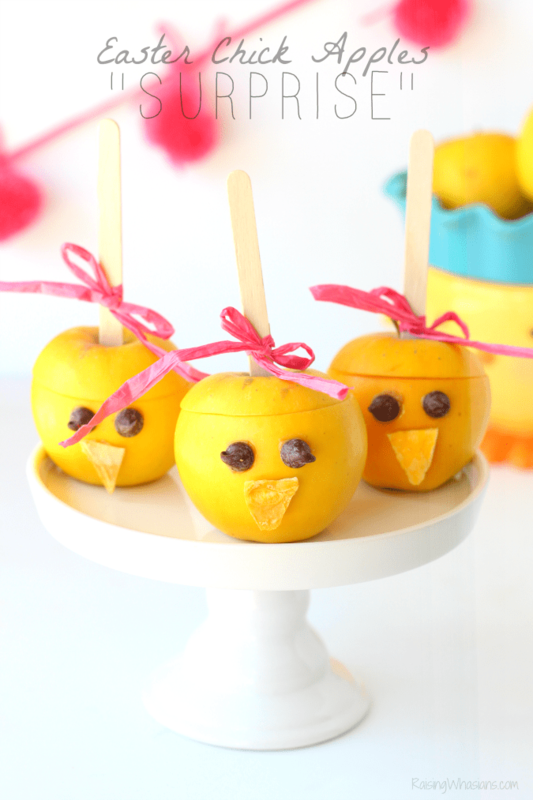 I love these ideas, so cute. Everything looks so fabulous! What a fantastic spread! 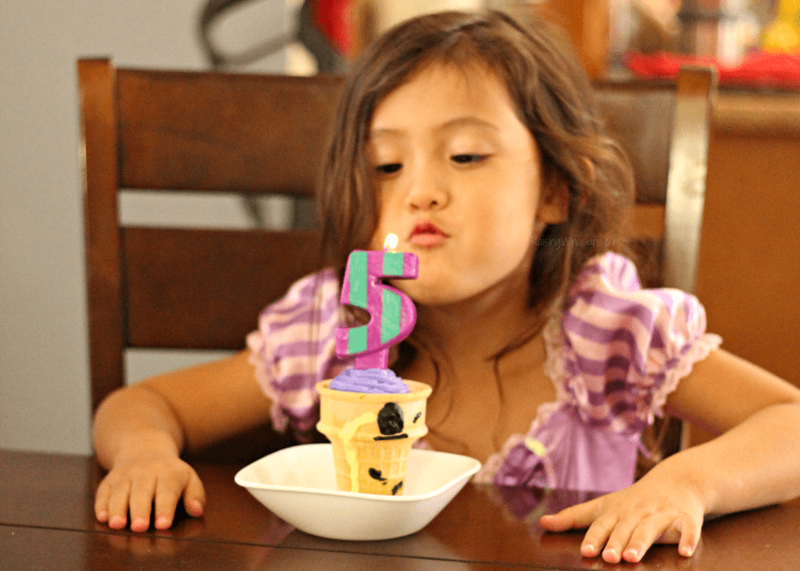 You surely made this a special 5th birthday for her. I appreciate all the details. I loved all the signs, themed food and props. What a wonderful idea–it looks like so much fun! Oh my, can I come to. You have a lucky little girl who has a sweet mom. This I am sure of, she and her friends will have a memorable fun time. This is absolutely gorgeous. You did an amazing job! What a fantastic idea! This is great! My daughter’s birthday is coming up this summer and she would love a party like this!